1. Preheat the oven to 190ºC, gas mark 5. Season the chicken. Heat the oil in a non-stick frying pan and cook the chicken thighs on both sides until golden. Drain on kitchen paper and place in a greased shallow baking dish. 2. 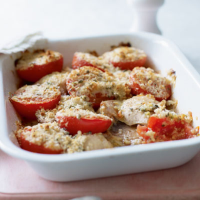 Arrange the tomatoes halves cut-side up over the chicken thighs. Mix the breadcrumbs, oregano, Grana Padano and seasoning then scatter over. Pour in the stock or wine and bake for 45–50 minutes until the top is crisp and golden and the chicken cooked through with no pink meat. Divide the fillets into four servings and serve with new potatoes and broccoli. Stir a couple of tablespoons of mixed seeds into the breadcrumbs for added crunch. Here it’s perfect to take a herby white that you can cook with as well as pour a glass alongside: Monteforte Passo Avanti, 2008 Soave Veneto, Italy.